Khumbu ice fall views from Everest base camp- Amazing view from Island peak. Among 33 peaks allowed to climb according to government of Nepal the Island Peak (6192m) is the most popular peak and the most beautiful peak of the Khumbu region. It can be scaled round the year as there is no any season restriction in Island Peak. It is also called Imja Tse peak. This beautiful and amazing peak gives scenic panoramic view from the top. The island peak was first scaled by British team back in 1953. 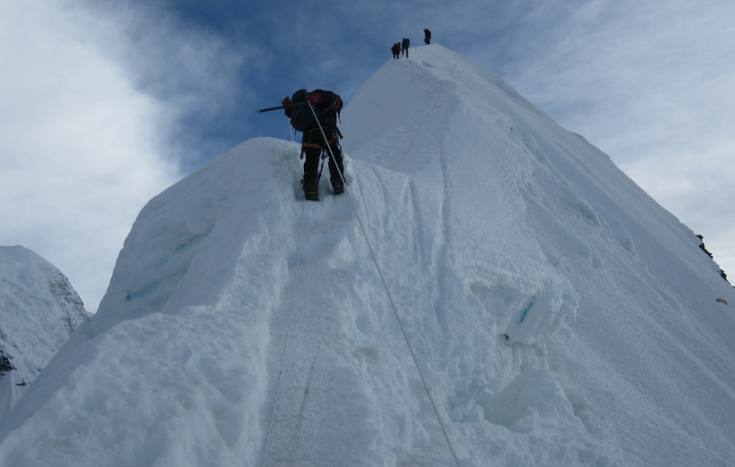 This peak is considered as the acclimatizing mountaineering experience before scaling larger mountains. Come witness this amazing bulk of snow in the lap of Himalayas. The scenic mountain flight to Lukla and the trekking along the Everest Base Camp trekking trails like Namche, Tengboche etc would give you double delights. This peak offers an enjoyable climb the peak, also provides some of the most striking scenery in the Khumbu. If the peak can be likened to an Island in a glacial sea, than the main land forms a semicircle of cliffs that rise in the north to the rugged summit of Nuptse ( 7879m/ 25850ft ), Lhotse ( 9501m/27870ft), Lhotse middle peak( 8410m/ 27590ft), as yet still unclimbed and Lhotse Shar ( 8383m/ 27503ft ). To the east, rising above the frozen waves of the Lhotse Shar glacier, is Cho polu( 6734m/ 22093ft ), beyond which can be seen the red granite mass of Makalu ( 8475m/ 27805ft). To the south of the Imja glacier and icy flutings of Baruntse (7720m/ 25328ft) and the Amphu peaks lead the eye to the lofty pinnacle of Ama Dablam ( 6856m/ 22493ft ), which is liked a giant sea – stack guarding the entrance to the glacial bay in which Island peak stands. The journey to the peak would enthrall you as it gives spectacular close view of other amazing peak around it. So, join the team of Backpacker for this amazing journey to the Himalaya. Your food (Lunch,Dinner and breakfast) and accommodation during the trek. Trip Achievement certificate,map and duffle bag. Day 04Acclimatization day at Namche Bazzar. walking 5 hours, O/N at guest house. Day 05Trek to Tengboche(3860m/12664ft). walking 5 hours. O/N at guest house. Day 06Trek to Dingboche(4410m/14468ft). walking 5:30 hours, O/N at guest house. Day 07Acclimatization day at Dinbuche. Walking 4:25 hours, O/N at guest house. Day 08Trek to Lobuje(4910m/16108ft). Walking 5:30 hours, O/N at guest house. Day 09Trek to Gorak Shep (5153m/16906ft). Walking 3:30 hours, O/N at guest house. Day 10Trek to Everest Base Camp (5363m/17595ft) and back to Gorekshep. Walking 5:30 hours, O/N at guest house. Day 11Hiking up to Kalapathar(5545m/18192ft) and overnight at Dingboche(4410m/14468ft). Walking 6 hours, O/N at guest house. Day 14Island peak base camp to Lower Panbuche( 3985m/12066ft). Walking 6 hours, O/N at guest house. Day 15Lower Panbuche to Namche (3440m/11286ft). Walking 5:30 hours, O/N at guest house. Day 16Namche to Lukla(2840m/9317ft). Walking to 3:30 O/N at guest house. Day 17Fly to Kathmandu from Lukla. O/N at hotel, B & B plan. Island peak Climbing trip can be organized to do combine service tea- house + camping (tented camp).If above itinerary doesn't address your plan,please feel free to enquire further. Our team of Package developer would develop the package as per your wish. Happy Journey and Welcome to the land of Himalayas.